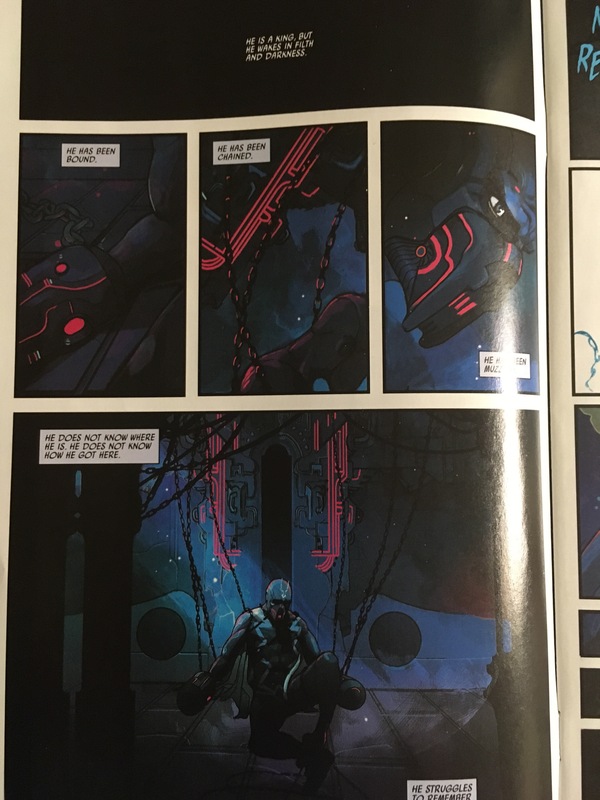 The new Black Bolt comic from Marvel is finally here, and it’s pretty great. Written by Saladin Ahmed with art by Christian Ward, Issue #1 kicks the series off into a strangely lit, dark direction. I’ve been a fan of Ahmed’s writing ever since I picked up his novel Throne of the Crescent Moon, during one of my “read all the Hugo nominees” phases, and I’ve been looking forward to this book for months. It was worth the wait. Black Bolt #1 feels like the start of a big, mythic story about escaping a strange Underworld. Black Bolt, king of the Inhumans, has woken up in a prison thanks to the schemes of his mad brother, Maximus. I love stories with chthonic themes, so this was a happy surprise. The exposition at the beginning of the story plays with poetic devices, reading almost like song lyrics (very metal lyrics), using a repeating mechanism as Black Bolt slowly regains awareness. Black Bolt wakes in filth. The sequence is pleasantly disturbing, Ahmed’s words laid over Christian Ward’s art, a psychedelic nightmare outlined in creeping pink lines. This new book promises to be weird and disturbing and a damn good read. I want more.